I'm an elementary school ALT in Japan, I don't eat a lot of meat & when I started working in 4 schools in a small town only one school said I couldn't eat with the kids if I ate my own lunch. This year the school's principal changed & the kids are really excited to see what I bring, they gather around and ask me to show them what I've made & they are so impressed that I made it myself. I don't have time to make impressive bentos I have two small containers one for hot food, usually it's a quinnoa based dish that I microwave before being summoned for lunch & one with yogurt that I add fruit & nuts to. The kids find it fascinating that I don't eat meat (I tell that I do sometimes but I prefer not to a grade 6 student quizzed me on why & I tried to explain the story of when I was in Uni I was vegetarian but I got sick because I didn't have enough iron & he wanted to know why I was vegetarian so I tried to explain ethical eating ~ the kids are really interested in finding these things out). I'm the only one of all the children & staff that doesn't eat the school lunch so I do feel embarrassed about it but for me there is too much food in kyuushoku & the nutritionist last year was young & too much of the food was fried or some days everything had meat in it. There is a new girl this year who is also young but the food looks amazing, it's still way to big for me though so I'm happy to keep bringing my own. When I was in elementary school, 1993(kinder), I remember friday lunches vividly. A square of breaded fish with a square of melted "cheese" under the breading, macaroni&cheese and jello. Around 4th grade we started having limp salads, but mostly vegetables were either limp green beans or mashed potatos. Fruits were suspended in jello. To be fair, by the time I got to highschool, apples had gotten onto the list as well as slightly more lively salads but still. A sack lunch would have been better. If you ask me, this is just a lame scam to squeeze more money out of the kids. Just saying! I go to grade school and the lunches are BAD! They have pizza every friday and monday, you can hold the pizza sideways and watch the grease drip down the sides. They serve chocolate, strawberry, and regular milk and juice that is, I quote, "100% juice from concentrate with other artificial ingredients." Still, some of what the kids bring isn't much better. Oh! And the toilet paper is the same as the napkins, while I'm on my rant. I'll admit, I took the occasional unhealthy lunch to school with me when I was a k-12 student in the U.S., but even my less healthy lunches (pasta salad or a sandwich and a piece of whatever fruit happened to be on the kitchen counter were common choices) were probably healthier than the vast majority of what the school offered. I'll admit, I've not been in a public school cafeteria in many years now, and my own children do not attend them at this time, but when I was the lunches that were served were typically made up of a greasy, unidentified meat product (most commonly in the form or a hamburger, hot dog, chicken nuggets, or something ground up and mixed with cheese and bread or starches of some kind), french fries as a "vegetable" side, and a dessert. Milk and juice were available to drink, but no water, and most kids got sodas from drink machines in the hallways to go with their meals anyways. Basically, you got a lower quality knock off of a McDonald's Happy Meal most days. That is not what I want my children eating day after day. I live in Turkey where fast food, even though omnipresent, still hasn't overcome the presence of home cooked meals served in schools. When I was in high school, we were given monthly charts showing what was going to be served in the cafeteria every day which was usually some kind of soup, a vegetable dish, a meal dish, a rice or pasta dish and desert along with the salad bar. Even though I have had my suspicions about hygene after seeing a cat leave the school kitchen, the menu itself was always reasonable and close to what your mother would cook for you at home. The poorly executed hygene was the main problem for me, so I would just make myself a sandwich out of tuna and whole wheat bread to take with me. Even after the new health regulations were put in place, I kept bringing my own food because it was convenient for me. 1. The school should get rid of any frozen fast food type stuff they serve in the cafeteria. 2. Provide parents with a monthly menu. 3. Pass the health inspections. 4. Put regulations on lunchboxes that can be brough from home. That's just my two pennies on this subject. Even though schools are required to serve 'balanced meals' (which taste horrible I might add), there are still several ways they get around this rule. For one, potatoes(as in french fries & happy face potatoes-which are deep fried death), ketchup, canned green beans and other various things, count as vegetables. Two, the regulations don't include 'snack bars' which serve slushies, cookies, fried chicken and various other types of junk food. Three, the regulations also don't cover having other companies come in and serving food. My school has Papa John's, Chick-Fil-A(not the grilled or salads, I may add, just the regular chicken sandwich), and a local pizza place. And if this wasn't bad enough, my school does serve 'health food'. Which is basically a turkey sandwich with pesto, lettuce and swiss, which isn't all that bad... Except it's more than TWICE what a slice of pizza costs. A slice of pizza (without the 'meal' which is basically canned fruit stored in high fructose corn syrup and chocolate milk) is only $2. The sandwich is $4.50. Yep. Also, you know how the principal mentioned milk vs. coke? Pretty much everyone who buys school lunch doesn't even bother with the regular milk, they go straight for the chocolate or strawberry flavored (another note, on at least 3 occasions I've been served spoiled milk). Still think school can offer better meals than I can? Even if I brought junk, I don't think it's the school's business to tell me what I can or cannot consume.. Dude, it's my body, I'm going to feed it what I want, and I guarantee it won't be any of the crap they try to serve me. I HOPE they'd never force my son to buy lunch. 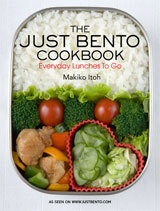 It's NOT healthier than the bento I pack! For that matter, it's not cheaper, either. School lunches for my son's school are about $2.50/meal and the selection is appalling. I don't know what color the sky is on the the planet where that principal is working, but I make bento with fresh fruits and veggies. I've never seen such a thing in a school lunch, except for those appalling thick-skinned, mealy-mushy apples they sometimes serve. Well, okay, my high school had a salad bar, but I don't think my son's does, nor would he choose to make a salad over the pizza and fries offerings. I don't mind the boy eating pizza and fries sometimes, but every DAY? No. That's not healthier than the bento I made him today (chicken, noodles, fresh grapes and sliced raw red peppers).